Programmateur Sprint Expert TOP40DIP (SMS) modèle S100. 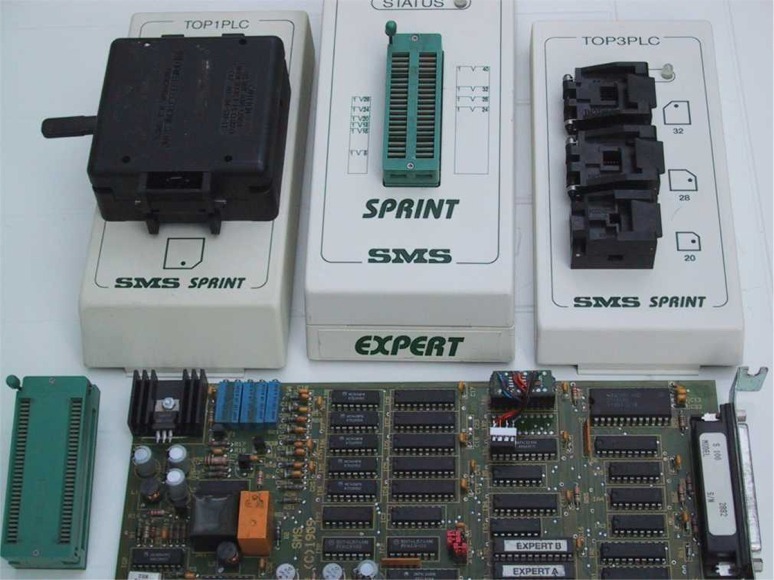 This Programmer Sprint Expert TM (c) 1989 SMS GmbH , 8994 Hergatz (West Germany) is Model S100. 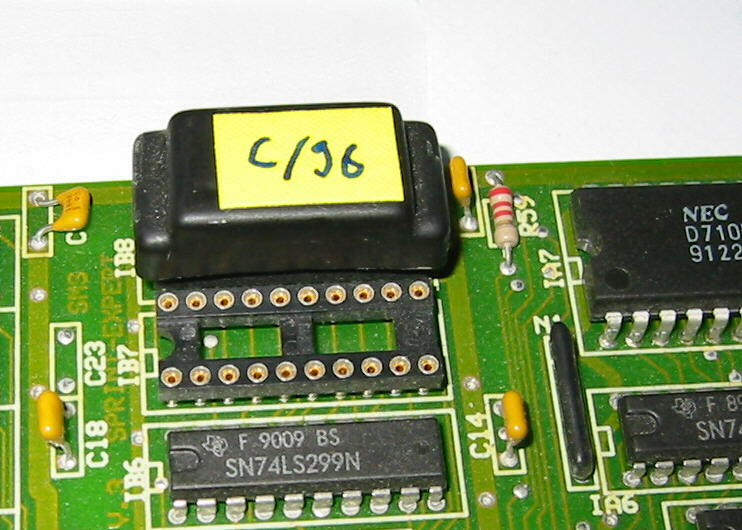 It is made of an ISA board as shown with Firmware chips marked SW 6/91 (IB7) and EXPERTA (IB1) , EXPERTB (IB2). PCB is SPRINT-EXPERT V.3 Jumpers S1 are set on 2 and 4 positions. Socket IB8 is empty. connector to the programmer is 37pins Sub-D. This version of programmer is the older version. With the PAL16R8 in socket IB7 marked SW 6/91 the only way to use this programmer is to use Sprint Expert Programmer Software Version V3.4 dated 1990 (Do not require any SMP and do not work with a SMP Module either) (Shift-Click to Download - 383 Kb) . PAL16R8 SW6/91 can be replaced by a PALCE16V8H ( or GAL16V8 ) with the following contents. The security block is made of 2 ic's, a resistor and a capacitor. As expected a PAL, Intel 5C032 (the chip you see at the bottom) and on top of the PAL a small PCB with a 9346 EEPROM (soic). The pins not showing up at the bottom are bend over to the top and soldered to the small PCB. (GND/DI/DO/SK/etc). Program a new 93C46 eeprom (it is easier to use a DIL version) with the C/99 code as shown below, turn off programmer, and remove module. Cut off top of module with a sharp knife, carefully scrape out the filler to expose all the pins of the eeprom and replace module in programmer board to check that it still works correctly. Remove the original SOIC eeprom from the module by carefully cutting its legs, and then attach six thin wires to the pads 2 - 7. (Pins 1 and 8 are unused). Connect these wires to the pins of either a similar SOIC ic or preferably, a 8 - pin DIL socket. 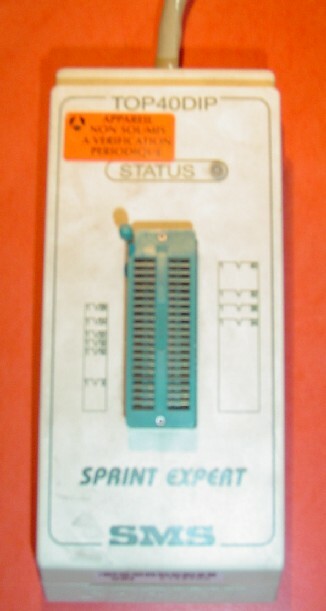 Refer to manufacturer's data sheet for details of the different pin connections. 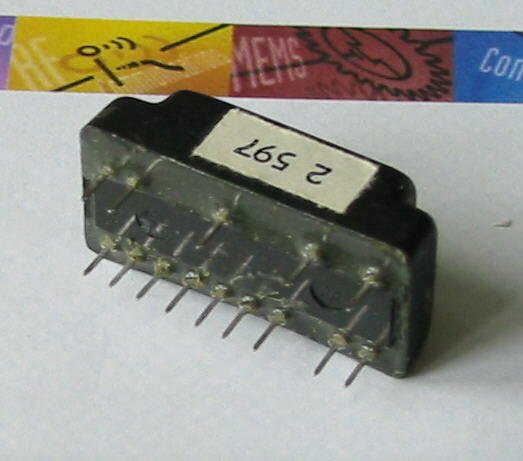 Original eeprom is 8-pin SOIC (Rotated version) type 93C46. (Catalyst 93C46J or equivalent) Any standard 5volt DIL 93C46 should work ok. Simple. Offset 0-2 is the serial number, offset 3 the checksum. All four bytes have inverted bit order. Take the serial number. Convert it to hex (three bytes). Offset 3 is the "checksum". This content allows you to use the TOP TOP40DIP, TOP1PLC, TOP3PLC, TOP68PLC and perhaps other TOPs. The Windows release doesn't work as is because the software has to be registered. Adapter diagram to allow you to program DIP-48 package MC68HC11 Microcontrollers with a TOP1PLC TOP. If you look forward for other information about these SMS GmbH TOP40DIP Sprint EXPERT Programmers, SprintPlus programmer, Sprint Plus48, do not hesitate to contact me by e-mail at: matthieu.benoit@free.fr . Also if you have any data about these programmers, do not hesitate to contribute to this page. Si vous recherchez des informations pour ce programmateur , vous pouvez me contacter par e-mail : matthieu.benoit@free.fr . De même si vous avez des informations sur ce programmateur, n'hésitez pas à contribuer à cette page.